Italico® cheese is a La Bottega di BelGioioso® original. Fashioned after Taleggio, a very traditional cheese, Italico is a semi-soft, washed rind cheese. Master Cheesemakers handwash every wheel many times throughout the aging process. The thin rind is edible and light rose to orange colored. 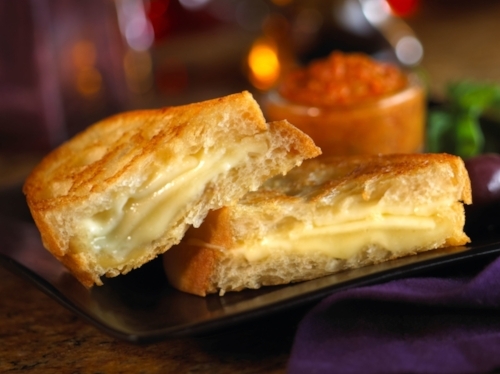 While it is a very aromatic cheese, its flavor is quite mild and earthy with an almost fruity finish. Italico is an exceptionally versatile cheese. It adds an earthy balance to any cheeseboard. Pair it with a glass of merlot or your favorite dark ale. Strawberries and raspberries help bring out the fruitiness of the cheese. If you’re looking for a great melting cheese to add to your next grilled cheese or pasta sauce, look no further. Italico mellows even more as it melts yet imparts delicious flavor in every bite. Preheat a nonstick skillet over medium-high heat. Per sandwich, butter two slices of ciabatta; season one side with sea salt and place that slice butter-side down in the hot pan. Place slices of Italico™ on the bread and top with the other bread slice, buttered side up. Season top side with salt and grill on both sides for 4 to 5 minutes or until golden brown and cheese is melted. Slice and serve immediately.